Welcome to Walaila Cottage! A four-seasons cedar panabode ideal for families and friends. 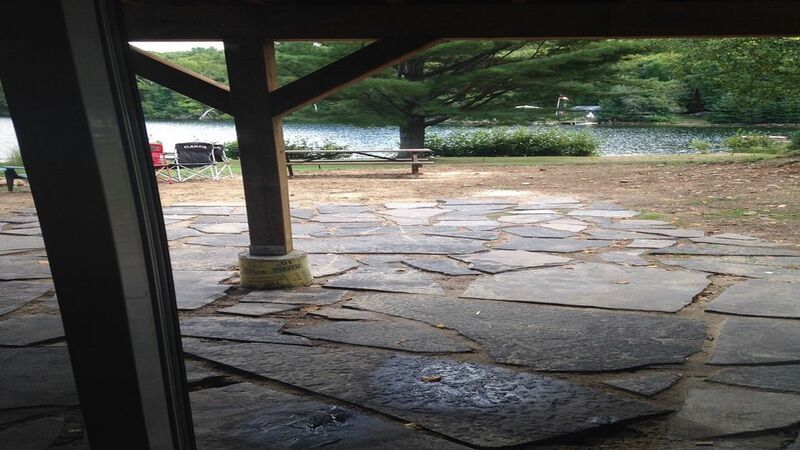 Situated on a quiet lake with large 160 foot shoreline frontage, perfect for swimming or lounging on the dock. Located in the Haliburton Highlands, in the geocaching capital, there is something for everyone - hiking, biking, snowmobiling, relaxation or adventure - you'll find it here! The property boasts a large grassy area leading up to the dock, or small sandy beach. Perfect for families with small children, it allows for shallow wading, or deeper waters for swimmers and divers. Turn-key, just come on in and enjoy! Walaila is fully equipped including BBQ, fire pit, outdoor toys, canoe and hot tub. Hello - we are the Weston's! (Troy & Vanessa) Married in 2008, we were keen to purchase a cottage property both being outdoor lovers. After visiting Cardiff Lake and seeing only one cottage, there was a handshake and the deal was done! We fell in love with the property, a small cedar panabode for it's gorgeous frontage and view of the lake. Since that time we have made extensive renovations to the property, as our family has since expanded to include two small boys (Greer and Asher). Seeing the cottage and surrounding wilderness through the eyes of a child has been an amazing experience for us both, and we look forward to a lifetime of memories at Walaila (which by the way means hummingbird) visitors to the cottage in the summer months. My wife and I decided to get away for a couple days and couldn't have been happier with our chosen location. Vanessa and Troy's place is cozy and welcoming. We relaxed in the outside hot tub even though it was freezing outside. Secluded and quiet it was everything a couple of city folk needed to unwind. Looking forward to a summer stay! My wife and I decided on we needed a last minute getaway with our five month old daughter on Thursday night so booked Troy and Vanessa’s cottage for the weekend. They responded right away and made sure everything was ready for our arrival the next day. The cottage was clean and warm when we arrived and had everything we needed from a well-stocked kitchen and bathroom to shelves loaded with books, movies and games. We enjoyed our snowy views of the quiet little lake from the living room and even from the deck (which would be an amazing spot in the summertime!). The first night we stargazed from the spacious hot tub and the second night enjoyed snow drifting down while we kept warm in there. Lots of trails to hike at the door step too. This was a great spot for winter access as the lake road is plowed and sanded by the township and is close to the regional highway. We will definitely be back! My husband and I spent Thanksgiving weekend here. We booked the cabin to enjoy hiking in the fall foliage and were excited to discover that it is in right in the Geocaching Capital of Canada!! We loved canoeing on the calm lake and sitting around the fire after a day of hiking. The hot tub was a welcome treat to our sore muscles in the evening. We would love to return in the summer with the whole family. The kids would love the lake and all the geocaching opportunities. Cute cottage on a nice lake . was a nice honeymoon getaway. Very beautiful cottage with quiet lake, We enjoy our stay. Looking to come back next year. thank you ! Nice cottage at beautiful lake. Charming cottage at beautiful Cardiff Lake. Ideal for swimming or kayaking. During most of our one week stay we had the lake largely for ourselves. The cottage was comfortable, except when at 90 plus degrees the lack of air conditioning was a bit of a problem, but this should not be taken as a criticism since we did not expect air conditioning. It was unfortunate that we experiences an unusual heat wave. Our issue with this rental was not the property but the lack of attention and responsiveness by the owners. To be sure we would get into the cottage on arrival we sent a message eight days prior requesting information on the lock box. There was no answer and on arrival we found ourselves in front of the cottage unable to get in. We did get the lock box number after messaging the owners again. One of the owners, presumably the wife, later apologized in a message saying that the information should have been provided ahead of time. She also stated that the housekeeper would drop in to make sure that we had everything we needed. The housekeeper never showed and the owner sent a message that his wife “misspoke” and that the cleaning lady had been in the cottage prior to our arrival. What the cleaning lady had apparently overlooked was that the shock tablets for the hot tub were not there, (therefore the hot tub could not be used) the battery of the fire alarm was dead and the thermostat did not work. There was food in the refrigerator which we left. When we sent a message to the owners regarding the missing shock tablets his answer was: “I see. I will let her know. Sorry about that”. This was on the second day of our stay and we never heard from the owners again. All in all we enjoyed our stay and with a little help from the owners it could have been even better. Shock is more an on going maintenance - it has nothing to do with the tub or use ability. We change the water often and it was in perfect condition for your stay. Sorry, but who suggested that you not use the tub? As for the code - yes, that is an oversight. My apologies - we had a guest cancel a couple years back and then use the cottage during their time they cancelled. We try to ensure we are protected. No body is perfect.